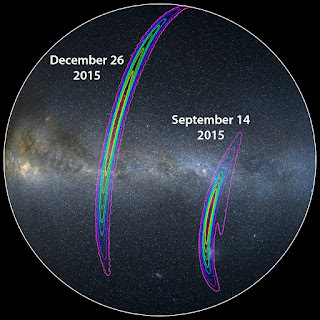 Living LIGO: Merry Christmas, LIGO: Another Gravitational Wave! Merry Christmas, LIGO: Another Gravitational Wave! WE DETECTED ANOTHER GRAVITATIONAL WAVE! On the evening of Christmas day 2015, at 9:38 pm CST (3:38 am UTC) at the LIGO Livingston Observatory in Louisiana, another gravitational wave signal was recorded. 1.1 ms later, the LIGO Hanford Observatory in Washington state also picked up the same signal. 70 seconds later, the supercomputer that runs analyses on the near real-time data noticed that there was something special in the data and sent out emails and text messages that some of us affectionately call the "Bat Signal". This goes out to scientists primarily to summon those who evaluate candidate gravitational wave events to determine if this event should be shared with traditional astronomers (i.e. ones with telescopes). I am on the list because I am interested in keeping up on the latest results. I remember exactly where I was: I was in my room at my mother's house outside of Pittsburgh changing clothes after getting back from visiting the in-laws (who live within a few miles of my family's home) for Christmas. I looked at the event record and saw that this was an extraordinary candidate gravitational wave in that its statistical significance was high but the signal wasn't as obvious in graphs as the first detection in September was. It was decided to send out the location of the possible detection to traditional astronomers and the emails started flying discussing the evidence that this was a true detection. It was determined that the preliminary information on the signal warranted starting the detection checklist - the large-scale investigations that try to disprove that the signal is real. Only after a candidate passes every test and has a high statistical significance is it accepted as a detection. The same checklist that was applied to the first detection, labeled GW150914, was applied to this candidate as well. Once this Christmas detection was verified, it was labeled GW151226 (the number reflects the UTC date that the gravitational wave was discovered) although we had nicknamed it the "Boxing Day Event" before the verification. Read the paper on the detection here. The signal is similar to the first detected gravitational wave (GW150914). We call this kind of signal a "chirp" because initially it has a low frequency which increases over time as does its amplitude. You've heard signals like this before if you've ever hear a slide whistle increasing in tone. The increase in tone reflects the increase in frequency and the loudness of the whistle represents the amplitude. The signal we detected starts at about 35 Hz (close to the frequency of the sound made by the second black key from the left on the piano) and reaches its highest frequency at about 450 Hz (very close to the A above middle C if you convert this signal into sound). Graph of the 1-second signal of GW151226. The red line is the prediction of what a gravitational wave from a 14.2 and 7.5 solar mass black hole merger would look like and the grey area around it is the signal that LIGO recovered from its data. The zoomed in portions allow you to get a better look at hour the prediction (in red) and the actual signal (in grey) compare. At the end of this signal, the frequency and amplitude both go up. The two black holes merge at the point where the amplitude of the signal is the highest (seen in the zoomed data to the far right). The plot above shows what we detected in our data compared to the predictions of a pair of black holes orbiting each other and merging into one. So this is similar to the last detection in that this is also a pair of stellar-mass black holes (formed from the death of extremely massive stars) but different because the masses of these new black holes are less than the first detection. Here, our newly detected black holes are 14.2 and 7.5 solar masses where our last detection was 36.2 and 29.1 solar masses. That makes this signal weaker than the last (the peak amplitude of this new signal is about 1/3 that of the first detection) but we are able to observe more orbits of the system here. We see about 27 orbits of these new black holes (corresponding to the 55 cycles of the gravitational wave we see in the figure) where we only saw about 5 orbits (or 10 cycles) in the first detection. It is interesting to note that lower mass black hole pairs will merge at higher frequencies than higher mass black holes. This means that the signal will stay in LIGO's most sensitive frequencies longer and that is reflected in what we see here. This new detection's signal is about 1 second long while the first detection is less than a half second long. The next question is where in the sky are these black holes? We primarily determine this using the delay in detection time between the two detectors. When the delay is large, there is a smaller area in the shape of a ring on the sky where the gravitational wave could have come from. The detection delay for the new detection is much shorter than the first detection, so our uncertainty is going to be larger. Below is an illustration of the areas on the sky where the new detection (the area to the left) and the first detection (the area to the right) are likely to have come from. Note that for the new detection on the left, there is another similar area on the opposite side of the sky that cannot be seen in this image. The location of both the new GW151226 detection (on the left) and the first detection, GW150914 (on the right). These are pictured on a star map (you can see the center part of the Milky Way galaxy on the left and extending right). There is another similar area for the new detection on the opposite side of the sky (not pictured here). The outer purple area is where we are 90% confident where the sources are located. The inner circles each have decreasing certainty. We will be better able to determine the location of a gravitational wave source on the sky when we have more than two detectors in operation. Fortunately, Advanced Virgo has completed their upgrades and is currently testing their new detector. LIGO's next observing run is expected in the 4th quarter of this year and Advanced Virgo will likely join the search before the completion of that run. When we detect more gravitational waves (which we expect since we will be even more sensitive than we were for the two detections we have already made and the run will be longer in duration) together with Virgo, we will know even more about what it is that we are seeing. This is an exciting time to be a scientist! Read the official LIGO "Science Summary" on this new detection, GW151226. Thank you,I also found relevent information from Savaliya Industries. I just want to say thank you for sharing all those Merry Christmas Wishes . I have been looking for those for over an hour now. I want to give those quotes to my girl friend. She finds it cute and she really loves Merry Christmas Wishes . You can buy Exclusive Collection of Lehengas online in USA, Canada, UK. Free International Shipping. More then 5000 Designs of Exclusive Lehengas, Bridal Lehengas, Designer Lehengas, Wedding lehengas.